Here you can find all info about Alpha Skunk from Alpha Genetics. 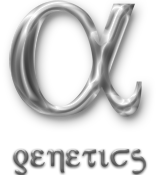 If you are searching for information about Alpha Skunk from Alpha Genetics, check out our Basic Infos or Lineage / Genealogy for this cannabis variety here at this page and follow the links to get even more information. If you have any personal experiences with growing or consuming this cannabis variety, please use the upload links to add them to the database! Alpha Skunk is a mostly sativa variety from Alpha Genetics and can be cultivated indoors (where the plants will need a flowering time of ±63 days), outdoors and in the greenhouse. Alpha Genetics' Alpha Skunk is/was never available as feminized seeds. Die Alpha Skunk ist ein Abkömmling einer Skunk #1 und ist somit zu 75% sativadominiert. Sie produziert enorm lange Buds und einen derart intensiven Geruch, dass man aufpassen muss, keine Unbeteiligten mit dem Duft zu belästigen. Der Stretch ist aufgrund der Sativadominanz relativ ausgeprägt und kann bis zu 250% betragen. Mit 35 bis 40 cm in die Blüte geschickt, erreicht die Alpha Skunk eine Höhe von etwa 1,10 bis 1,20 m. Dafür braucht sie nicht allzuviel Platz in der Breite und eignet sich hervorragend für einen Sea of Green. Außerdem ist sie eine ideale Pflanze für Anfänger, weil sie unempfindlich ist und nicht übermäßig viel Pflege benötigt. Im Innenanbau muss die Alpha Skunk zwischen 60 und 65 Tagen blühen, um Ihre Endreife zu erlangen. Im Freilandanbau schafft sie dies bis Ende Oktober. Sollte das Wetter gegen Ende des Lebenszyklus sehr feucht sein, sollte man die Buds regelmäßig auf Schimmel kontrollieren, obwohl die Alpha Skunk nicht sehr anfällig dafür ist. Der Effekt sorgt für einen ordentlichen Couchlock, den man aber Dank der Sativaeigenschaften voll miterleben darf und nicht vorher einschläft. Click to show all parents of Alpha Skunk in our dynamic family tree map. Do you know something more about Alpha Genetics' Alpha Skunk? Please help to make this database better and upload/connect your information here! Pictures speak louder than words! Upload your "Alpha Skunk" Photos here and help other growers to get a better impression of this variety. You have grown Alpha Skunk together with another variety? Please fill out our Strain VS. Strain direct comparisation form! Our strain reviews are multilingual, searchable and can be very detailed - including data about the grow, aroma, effects and taste! Please upload your Alpha Skunk Review here to help the other seedfinder users! You have experience with the medical qualities of Alpha Skunk? Sharing your information here maybe can help other people! You've stumbled upon a Alpha Skunk related thread into a forum or growers community? Connect it here and enable othe users to find this information fast and easy! You found a related video with additional information or grow-infos about Alpha Skunk on YouTube? Please connect it here to the strain info page!